In what is fast becoming the norm, AMD has adopted a staggered-release approach for its most powerful consumer CPU that's known as 2nd Gen Ryzen Threadripper. This release is interesting insofar as the four-processor line-up has been bifurcated into the workstation-specific WX and general high-performance X ranges. That makes sense given the massive 24- and 32-core counts on the premier WX processors, primed for professional applications that scale well across a huge number of cores. As usual, the easiest way of digesting what's what is to take a look at the high-level specifications. So let's roll out the Table of Doom that's now headlined by the Threadripper 2990WX, 2970WX, 2950X and 2920X. The first improvement over last generation's performance chips arrives by way of Threadripper 2 using the same 12nm Zen+ architecture and general 2nd Gen Ryzen features present on other, recent processors. 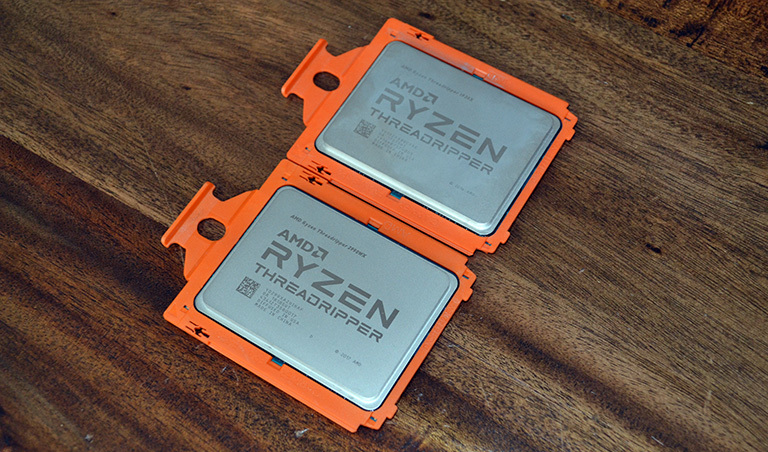 Taking the process enhancement first, AMD is able to achieve the same speeds as first-generation Threadripper at 80-120mV less. Looking at it the other way, the chips are able to run faster at the same voltage, and AMD has used this exact characteristic to boost the Turbo clock by a reasonable degree - up to 4.4GHz for the 2950X. It's not all about peak performance, mind. Another benefit of Zen+, arguably more important, is Precision Boost 2. The technology keeps the frequency as high as possible, for as long as possible (given environmental conditions), on as many cores as possible. Its aim is to keep going until the silicon hits a voltage, current, frequency or thermal limit, without caring about how many threads are being used. The purpose is to maximise performance for every thread by only gradually reducing frequency when more and more are called into action. Point is, Threadripper 2 doesn't want to leave any frequency on the table. Exact per-thread frequency is dynamic because it takes ambient cooling into account. Have a great cooling setup? Your chip will likely run a little faster. Benchmarking in a significantly lower ambient temperature? Chip will run a tad faster, too. These ambient smarts, as AMD likes to put it, come under the SenseMI technology baked into each chip. 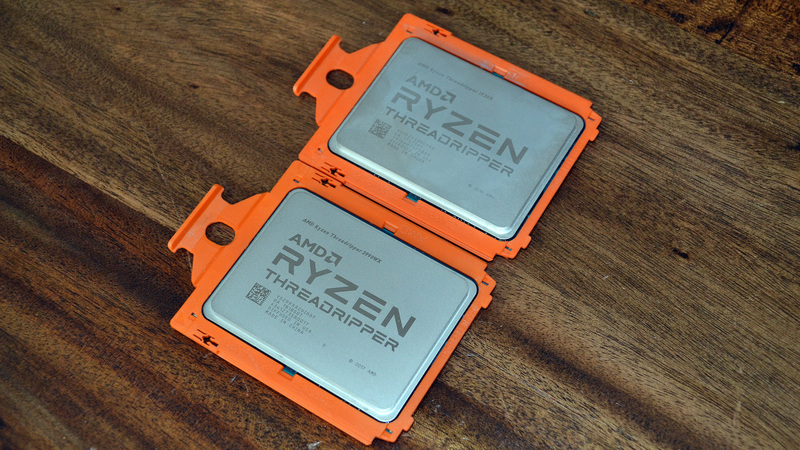 Last but not least, Threadripper 2 chips have significant latency improvements over their predecessors, which is mostly handy for low-thread performance. AMD says there's an eight per cent improvement in L1 cache latency, nine per cent for L2, 15 per cent for L3, and two per cent for DRAM latency. Those are solid numbers, but let's not forget that first-gen models were mediocre in the latency stakes, well behind Intel's 8th Gen Core. The above improvements will offer, say, 10 per cent more oomph per thread than first-gen Threadripper. Great, but nothing to write home about. The real story this time around is the sheer number of cores on a consumer chip. The 2990WX is a 32-core, 64-thread monster equipped with decent speeds and quad-channel memory support. 2970WX is hardly a shrinking violet, either, with 24 cores and 48 threads. Even the X-series, comprised of the 2950X and 2920X pump out 16/32 and 12/24 cores and threads, respectively. Eagle-eyed readers will notice there's no 2nd Gen 8-core offering. A chip off the old TR4 block - Threadripper 2990WX at the bottom. If an application scales well across threads, and decent workstation-specific ones do, the 2990WX ought to set the benchmarks on fire. There is little need to get into the really technical nitty-gritty of how AMD has achieved the impressive core count in this editorial, but as a high-level overview, 2990WX is built of multiple dies that each resemble, roughly speaking, an eight-core Ryzen 7 2700X chip. Four of these dies are lassoed together by in-house Infinity Fabric and are provided precious memory bandwidth via that quad-channel infrastructure running at 2,933MHz. A good understanding of how the technology works can be gleaned by looking at our server-specific Epyc overview, and though whilst not exactly the same, due to having half the memory channels and a lot less I/O, Threadripper 2 looks to be a balanced design for compute-heavy apps. Of course, upping the core count, even with the benefits of a 12nm process, leads to higher power consumption figures. The WX chips consume 250W at stock speed while the X duo keep to first-gen's 180W. AMD says that all present TR4 boards will support these new chips with a BIOS update - handy if you bought into the Threadripper ecosystem last year. The same motherboard support is also useful insofar one can reuse cooling. Scan to the right of the table once again. Notice the $1,799 price for the 2990WX? It's the highest AMD has ever charged for a non-server CPU in recent times. The company feels comfortable doing so because rival Intel's 18-core, 36-thread Core i9-7980XE is dearer still. In fact it's no coincidence that AMD offers more cores and threads than Intel at each price point, continuing the theme set by regular Ryzen last year. The knock-on effect of Threadripper 2's arrival is reduced pricing on first-gen models. The 1920X, for example, a 12C/24C performance processor, can be had for as little as £349 right now. Similarly, the 1950X	is available at under £600. It's a good time to stock up on the core count. The commentary thus far has rightfully been impressed that AMD has packed 64 threads into a single chip without moving sockets or changing generational compatibility. Yet it's worth remembering that Threadripper 2 WX is not general-purpose chip. The sheer thread count ought to work wonders in certain applications but, as you will see later on, is found wanting when gaming. There's a workaround for this, where the chip is put into reduced-core 'Game Mode' via a reboot, yet the solution is far from elegant. You can't have it all, evidently. More pragmatically, it's worth knowing that the top-line 2990WX chip is available today while the 2950X is coming at the end of the month. The remaining duo is slated for October. Lots to take in, but that's enough jibber-jabber, let's now roll the benchmark dice and see how Threadripper 2990WX performs in a wide variety of tasks.